Walls built using the traditional Stretcher bond are just a half brick wide. As with any wall built of brick, no two adjacent vertical joints should be in line. With a straight wall this is not a problem, just offset each course by half a brick. When turning a corner at the end of a straight run again causes no problems, just interlock the two runs of bricks on every other course. 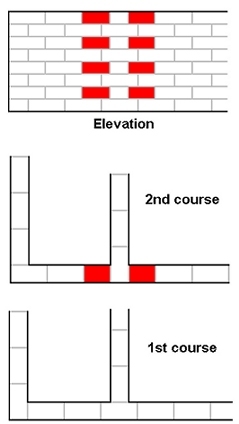 When joining into a wall part way along the wall, it's necessary to use two 3/4 bats (coloured red - one on either side) on the main face of the wall on every other course.